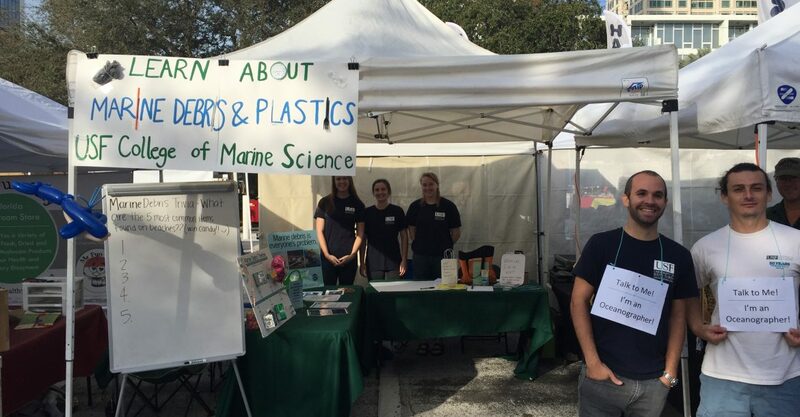 USFCMS graduate students, Luis Sorinas, Juan Millan, Becky Scott, Shannon Burns, and Maddie Schwaab, at the CMS outreach booth, excited to teach the public about marine debris. ST. PETERSBURG, FL – On Saturday, February 2, 2019 students from USF College of Marine Science volunteered at the St. Petersburg Saturday Morning Market to teach market-goers about marine debris and plastics. Thus far, the partnership created between the college and the market has resulted in two booths – the first focused on ocean acidification and the second on marine debris – with the overall goal of increasing marine science literacy across St. Petersburg. Market-goers played marine debris trivia, guessed the average degradation time of household items, and learned how marine debris impacts organisms living in the ocean. In addition, they learned how humans could lessen our impact through reducing, recycling, and helping with beach clean-ups. Overall, more than 100 St. Pete citizens visited the booth, eager to learn more about marine debris and discuss science with the students.